Email customization allows you to change the content of the emails both parties of a video meeting receive (that would include both user and guest(s). For example when a meeting is booked, rescheduled or about to start. With booking forms, you can allow customers to directly plan a meeting with you or your colleagues. Enable reviews to gather valuable feedback from your guests. You can edit the review questions (max 3) and let your guests rate you from 1-10 after your meeting ends. Connect your Google Calendar with our tool in order to automatically synchronise your availability. 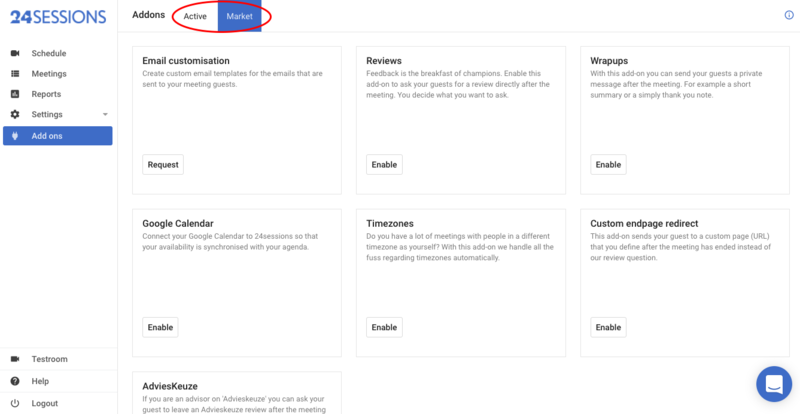 This prevents your customers from scheduling double meetings at times you already have other appointments in your schedule. Scheduling international meetings has never been this easy. Enable this addon to have international customers book a meeting via our planning tool which is autogenerated to your guest's timezone. This addon allows you to send your guest to a custom page (URL) right after a video chat meeting. Are you connected to the largest network for finding service providers 'Consumentenbond' in The Netherlands? If you have a profile at Advieskeuze.nl, you can enable this addon in order to redirect customers after a meeting to allow them to fill out an official certified Advieskeuze review.